There is not a single minute in class that someone is not clearing their throat or coughing. As a freshman, I didn’t believe in this so-called “Penn State Plague.” The upperclassmen told me to pack for all four seasons because the weather here apparently causes everyone to be sick. However that is not the case at all, it is not the weather that causes us to be sick but person to person contact. According to this article, cold weather MAY dry your nose which compromises it’s ability to fight infection which is directly responsible for getting you sick. When you have been in cold weather and suddenly expose your body to warm air, ‘rebound vasodilation’ occurs. This is when your nose gets congested and you are forced to breath through your mouth. All of these situations combined are what MAY trigger cold symptoms. Some symptoms may include a runny nose, sore throat, cough, sneezing, and even a mild fever. So really, all it takes is for one person to cough and contaminate the area that they have been in. Then someone must come in contact with the contaminated spot and pass it on to other people. A few weeks ago, my roommate was extremely sick and I was the one to take care of her. I guess I hadn’t cleaned myself properly after helping her because I have been sick and coughing like I smoke 3 packs a day. It’s obvious that I am not the only one coughing nor am i the only one that DOES NOT carry a hand sanitizer with me at all times. Rarely are we aware that we are constantly touching tables, seats, other people, and ourselves all the time. We have learned as babies that we should constantly wash our hands so we can lessen our chances of catching a cold or other illnesses. So why are we still getting sick? A few years ago I read an article in Times Magazine about how the germs that someone sneezes out stays in the air for about 2-3 hours. My theory is that perhaps we are inhaling the germs from those who have sneezed. OR people are getting lazy with their hygiene. 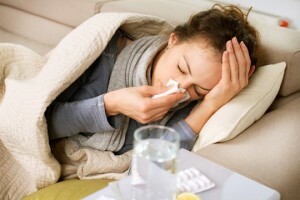 There are many viruses that are identified to be the cause of colds. The human rhinovirus is a mild yet highly contagious virus that grows best inside a human nose. The coronavirus causes severe acute respiratory syndrome (SARS). Mild infections in adults are usually lead by human parainfluenza viruses (HPIVS), adenoviruses, and respiratory syncytial virus (RSV). There are also unidentified viruses according to National Institute of Allergy and Infectious Diseases. How do we prevent ourselves from being attacked by the plague? Wash wash WASH. We are always touching doors, floors, chairs, and etc that have been touched by another thousand. Remember that there are people who sneeze and cough right into their hand and continue on with their day, so remember that once you’ve touched a public item or been in a public area, DO NOT touch your face and go wash your hands. To those who are sick, I hope you feel better. Load up on the vitamins and remember to get your sleep. Let your body heal you! This entry was posted in Uncategorized on September 16, 2016 by Amily Zhuang. I think we all know someone at school right now who is sick. Everywhere I go lately I hear someone telling me how bad they feel. Even in class when Andrew is talking all you hear in the background is half the class having a coughing attack. I agree with you, there is a plague right now. Me and my roommate are very sick but most of my friends have been sick this past weeks as well. Since I am the type of person that gets sick very easily I have been trying to find more information about how to make my immune system stronger. Many people have told me that getting the recommendable hours of sleep, eating a healthy diet and taking vitamins is great so maybe everyone who is sick should try that out besides washing their hands constantly. Here is a link of recommendable things that should be done in order to strengthen your immunization system. Wow, I can relate to this post extremely. I am just getting over what a thought was a cold. Which ended up being two weeks too long. I found myself in the ER where later finding out I had Acute Bronchitis, which is brought on by cold and flu viruses and is contagious. It’s scary how sick i was in the middle of AUGUST, I’ve never experienced anything like this until I came to this enormous campus. There’s so many germs and so many people coughing in all of my classes! I’m almost afraid to sit in my lectures now. Perhaps reading up on some common college campus virus will all help us stay a little informed and keep us more alert when trying to protect ourselves from the germs. I can really relate to this article since I definitely have the “Penn State Plague.” I have the simple common cold symptoms like stuffy nose, coughs and sore throat. After reading this I feel like i should lysol my room a lot and always keep hand sanitizers and tissues on me. I realize that this school has so many students and that when one gets sick, it will spread around like wildfire. I found this article online http://www.collegian.psu.edu/news/campus/article_573ce152-bc9a-11e4-9518-bf06a0045d8e.html and I thought it was interesting how they began to create care packages for students who developed the plague. I completely agree with what you are preaching. When sitting in class with hundreds of people someone is bound to be sick. We cant avoid it in any way but we can prevent it. I didnt think it would happen to me but it already has so nobody is immune to the plague. Here are some extra tips to stay clean.